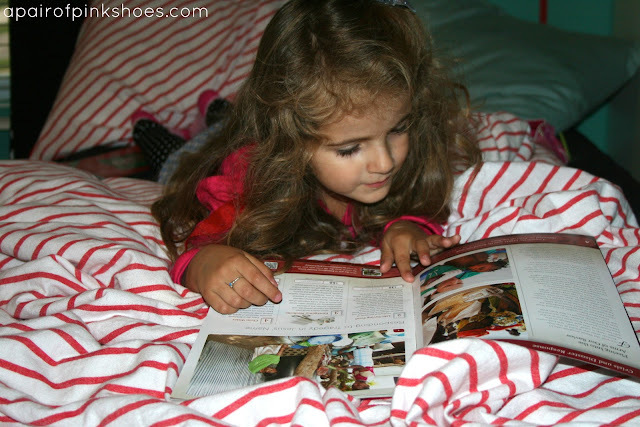 Pink Shoes: Learning how to Christmas shop. Learning how to Christmas shop. are showing up in my mailbox. Getting the mail is a highlight of our day. Georgia and I spread it all out on the floor and look at the magazines together and make up stories about the people in them, she cuts out her favorite pictures, I dog-ear my favorite ideas, she asks me to buy her something crazy like everything that comes with the American Girl doll Kaya, and I say the typical mom line, "We'll see. Christmas is coming." But we probably won't see about that. 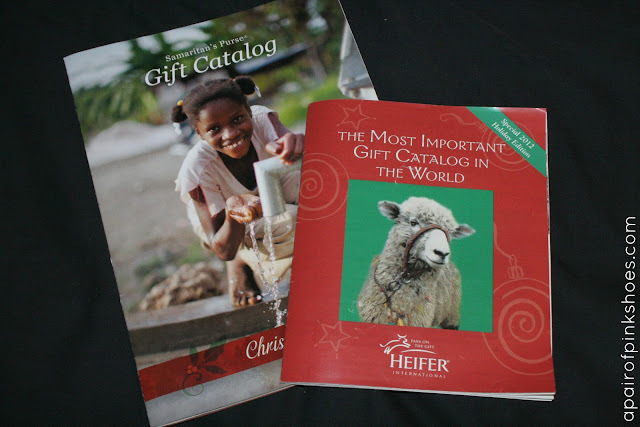 However, last year, we got the Samaritan's Purse and Heifer International catalogs in the mail for the first time and they mesmerized Georgia. 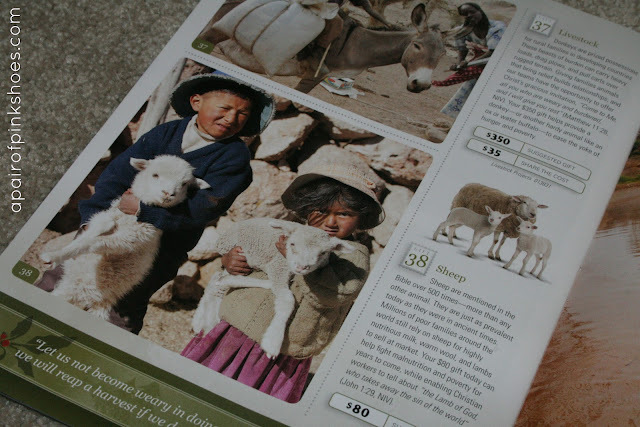 She poured over the pages of both magazines, asking what mosquito nets were, why kids were holding goats, why the houses looked different, why did that baby look sad, what's a well, what are they eating, what's wrong with that boys leg, and what are we supposed to do with this magazine? When I told her we could pick something out of it to buy for little kids in another country who didn't have as much as we did she immediately found the page that listed building a bush hospital for $35,000 and asked if we could buy that. I told her that was a lot more money than we had to spend, but asked her if she'd like to pick something else out. She said yes. 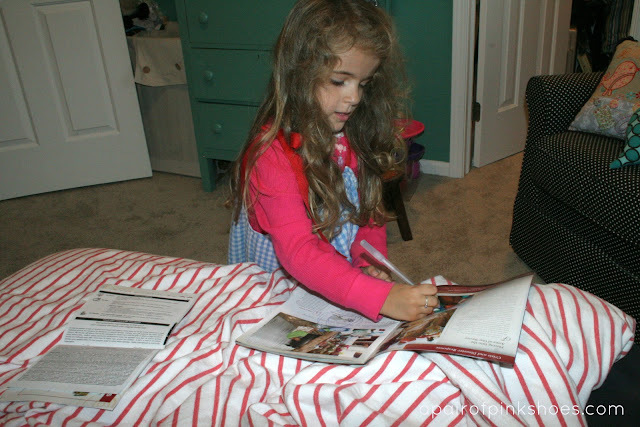 And then she took the magazines into her room and flipped through the pages for about twenty minutes--longer than she'd ever spent looking through an American Girl catalog with me. I asked her what she was doing and she told me, "This is a hard choice. I'll come out when I'm done." She was two and a half. She eventually settled on some baby chicks that would provide eggs for needy families in other countries. 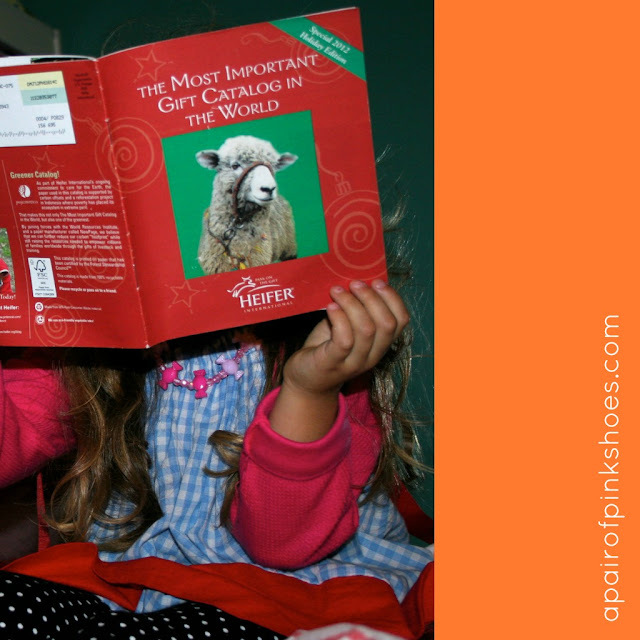 Yesterday, our catalogs came again. And we sat down to look at them. She didn't exactly remember looking at them last year, but she was just as interested this year. It's a serious job. A job that is serious all on its own. I don't really push it. I just answer her questions in an age appropriate way when she asks them regarding the pictures she's seeing. She's older this year so she immediately knew that the pictures were of kids in other countries....she's very intrigued with other countries all of a sudden. She is also well aware that we won't be getting an actual goat at our house if we choose to buy one; that it's for someone else. She took some time this afternoon to decide what she wanted to get. I had to steer her away from training a doctor, for $2200, but was surprised when she picked medicine. "Really?," I said. I thought for sure she'd go for a bunny, or some fish, or some chicks again--definitely the most appealing to little ones, right? She was sure. I asked her why. "I've had to take a lot of medicine.....for my bottom.....and if I didn't have it, my bottom would still hurt. I don't want a little kid not to have medicine. That would be terrible." I agreed with her and told her medicine was a great choice. A really great choice. I think the most touching thing to me about this tradition that we're building is that Georgia drives it, and it gives me a glimpse into her heart. 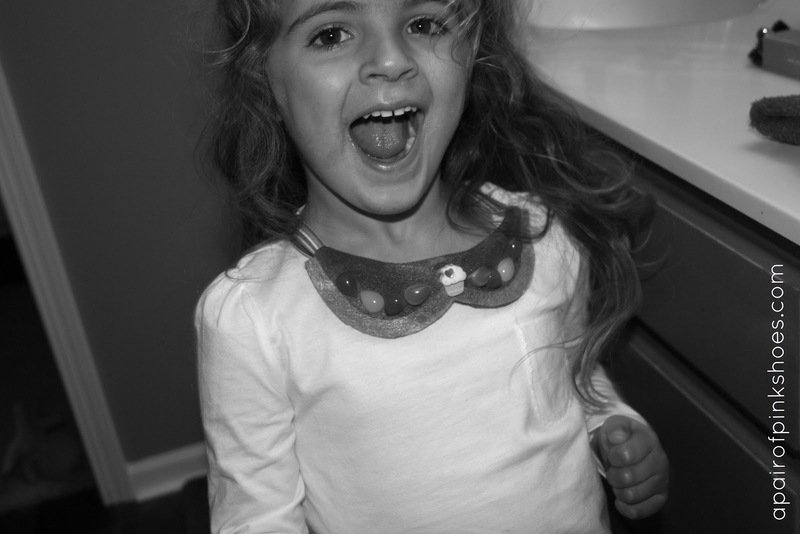 A heart that is there, even though she's only three and a half. A heart that is developing and learning to care about people and making connections--one that is capable of more thought than I give it credit for. She likes thinking about other people, and of course herself too, but she's learning that it's a good thing to give away what we have if we have more than we need......and even if we don't. I think it's easy to underestimate the empathy and generosity that our kiddos might have. And maybe we're not even under-estimating, we're just not giving them the opportunity to grow that muscle. 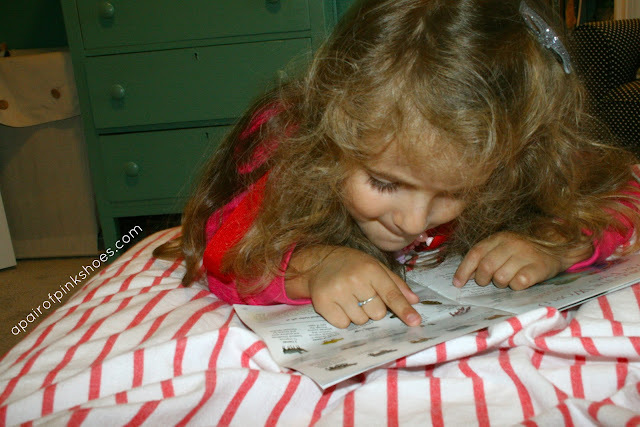 Never fear, she went right back to asking for toys within fifteen minutes of making her choice....but for a moment....she was given the opportunity to think bigger than her. I think it's crucial that we give our kids those chances while they're young, while they're developing their sense of global responsibility. And if we can....let them see it in action. It's just a little thing. A blip, maybe, on her Christmas shopping radar......but it's something. We're also going to head to Target tomorrow to buy supplies for an operation Christmas child shoe-box.....check out what that's all about here. 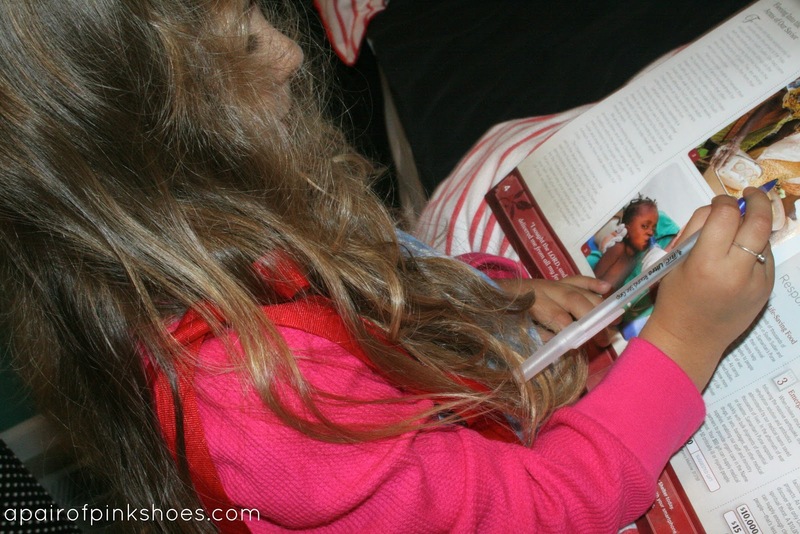 What else do you do with your little, little ones to build a charitable heart in them? We can all use the ideas like crazy! I found this picture buried in my camera. I think it sums up how I feel about the weekend being here! Have a good one. I love this!! 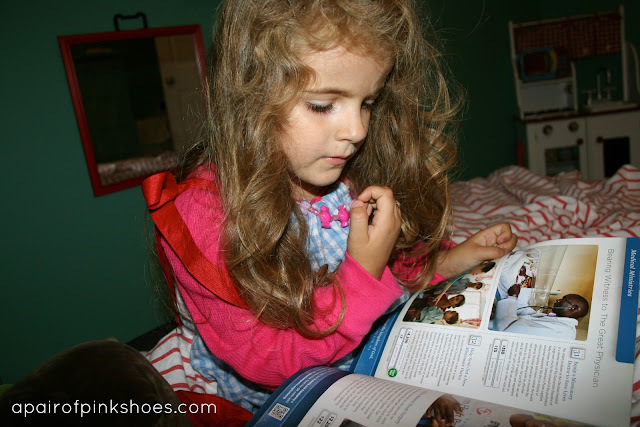 I love that even at the age of 2.5, she poured over those catalogs and was so thoughtful about it and that she's driving the decision. What a great tradition. It truly does show that she has an amazing heart. This is so great! Your girl is so sweet. And you've inspired me to page through that same catalog (that has been sitting on my kitchen counter) with my daughter. Such a great tradition to start with your children! I love looking through the Compassion magazine also. Also LOVE filling shoeboxes every year! Hello. Good-bye. See you soon. Fall. Michigan at its best. Pink Stuff & I'm Sorry. What I've learned in 35 years.